This celebrated new book breaks convention by providing a blueprint for educators to align how they teach with how brains best learn. ‘Brain-Friendly Teaching: Tools, Tips & Structures’ is the culmination of decades of research by former clinical psychologist and professor of psychology and education at the University of California, Dr. Spencer Kagan. Any teacher can master and implement the book’s six principles that will see students learn more efficiently, retain more information and unleash their true potential. San Clemente, CA – With four decades of research and over one-hundred books and scientific journal articles to his name, Dr. Spencer Kagan has picked through thousands of different teaching models. However, his latest book breaks convention and bucks the trend of intricacy to expose a model that cuts to the very core of educational psychology – aligning teaching practices with how brains best learn. Dr. Kagan calls it ‘Brain-Friendly Teaching’. Everything is showcased in ‘Brain-Friendly Teaching: Tools, Tips & Structures’ which can help any teacher better nourish the brains of their students and unlock their boundless potential with little effort. Become a brain-friendly teacher! Put the power of brain research and theory to work in your classroom. Your students will learn more, learn more quickly, retain and recall more, and like learning more. Dr. Kagan's extensively-researched book distills the world of brain science into 6 essential principles that will align your teaching with how your students' brains naturally learn. For each of the 6 brain-based principles, you will find practical tools, tips, and structures to easily make the leap from theory to practice. Teaching is so much easier and more successful when you do it the brain-friendly way. “Thousands of scientific research studies have been analyzed and translated into action items for teachers,” explains Dr. Kagan, who is known around the world for his ability to convert brain science principles into practical tools. Each of the six principles is introduced with some easy-to-understand research and is then transposed into accessible ‘actions’. For example, take Principle 4 ‘Emotion.’ Extensive research demonstrates that positive emotion dramatically increases creativity, problem solving, and even IQ. To translate these research findings into easy-to-implement tools for teachers, Dr. Kagan provides thirty-seven practical ways in which any teacher can elicit positive emotions while teaching – including football-style team chants! Surprisingly, the research indicates praise prior to performance enhances performance more than the usual praise following performance! Dr. Kagan believes that there has never been a better time for this kind of book. “The truth is that, while our teachers appear to be working harder than ever, they’re mostly using outdated methods that go against the grain of how students’ brains naturally work. This book almost flips things on its head so that a teacher’s job gets easier and a student’s time in the classroom is more fruitful. It’s a powerful lever that can move mountains with very little effort,” he adds. 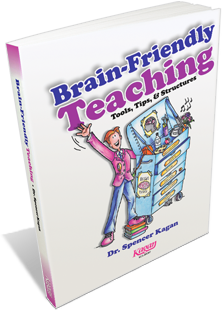 ‘Brain-Friendly Teaching: Tools, Tips & Structures’, from Kagan Cooperative, is available now. Click here for more information. Copyright © 2019 Kagan Publishing & Professional Development. All rights reserved.